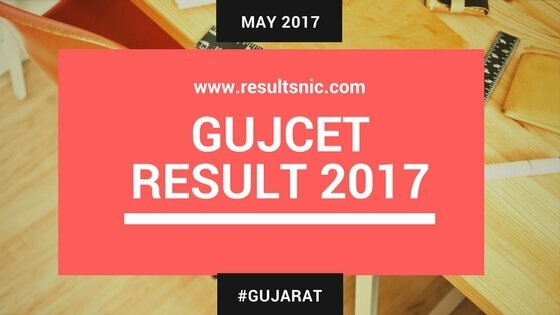 GUJCET Result 2017 Released on 23rd May 2017. Students can get their Gujarat Common Entrance Test Examination Result 2017 from the official website of GSEB. The results are available on the website gujcet.gseb.org. The GUJCET Examination 2017 was organised to provide the admissions into various B.Tech and B.E courses offered by the various engineering institutes Gujarat State. The engineering entrance examination in Gujarat was conducted across examination centres across Gujarat on 10th May. Candidates will be provided admissions on the basis of the merit list composed of 60% weight of marks obtained in 10+2 standard qualifying examinations and 40% weight on marks obtained in GUJCET 2017. Press submit submit button to get the result. The result of GUJCET 2017 is available on the website of gseb.nic.in. The candidates must enter the rollnumber to check the GUJCET 2017 result. Secured scores of the candidates in the examination are displayed in the declared GUJCET result. The merit list of GUJCET 2017 will be prepared and released after the result of GUJCET 2017 is announced. Only those candidates who are listed in the merit list will be able to participate in the counselling session. Registration for counselling of GUJCET 2017 will start on 1st June 2017.Selected candidates from the merit list must register to the counselling process. Students must pay the fee for counselling and obtain PIN. The counselling of GUJCET 2017 will be online. Allotment of seats in various branches will be done on the merit status, availability of seats and the category of the subject in the process of counselling. Seat allotted students will report on the allowed colleges and institutes for verification of original documents with attested photocopies and payment of tuition fees. In 2014, GUJCET 2014 Result was declared on 23rd May. Approximately 40,000 students appeared for the exam and majority of the students qualified in the entrance test. From the year 2013, Gujarat Secondary and Higher Secondary Education Board (GSEB) has decided to make the examination tougher. Since then, multiple choice questions included as part of the examination. Candidates who have passed Higher Secondary Certificate Examination in the science stream conducted by Gujarat Board are only eligible to participate in GUJCET examination. Candidates are also supposed to appear for class 12th examinations in the science stream and then they are expected to fill a separate application form for the Gujarat Common Entrance Test. The Gujarat Secondary and Higher Secondary Education Board (GSEB) is a government body responsible for determining the administrative, policy-related, and academic direction the state's higher secondary education system. The Gujarat Secondary and Higher Secondary Education Board were recognised on 1 May 1960. GSEB is managing the examination, syllabus, curriculum, results in Gujarat state now. The Gujarat Common Entrance Test 2017 is known as GUJCET 2017, is conducted by the GSHSEB Board. GUJCET 2017 will rank the candidates and shortlist them for admission to engineering, degree and diploma pharmacy courses for non-medical (Group A) and medical (Group B) and both group AB students. The exam would be based upon the third-semester and fourth-semester curriculum followed by the Gujarat Board for Class 12 Board Exams. The multiple choice option based exam would consist of question from chemistry, physics, biology and mathematics.